Please note our revised opening hours - Thank you. The area's premier picture framer for over 30 years. 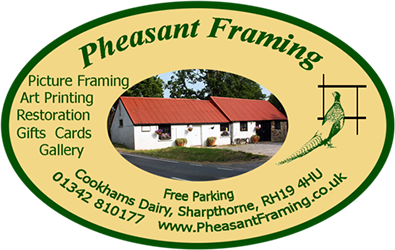 The business was first established in a building which had a "Pheasant" weather vane (hence our name) and in 1987 moved to its current location in a converted dairy in Sharpthorne where, due to a reputation for sound advice and achieving a high standard of framing, it has flourished. 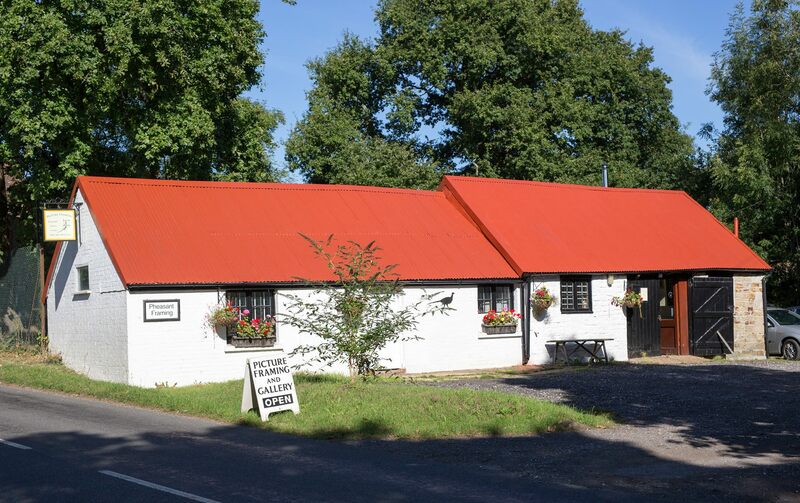 We are located to the north west of the beautiful Ashdown Forest and close to East Grinstead where the borders of Surrey, West Sussex, East Sussex and Kent meet. We are able to carry out any framing request and have the most extensive range of mouldings from across Europe and the Far East on display, from basic black frames through to wide ornate gilts and fabulous swept frames. In order to ensure that we can satisfy all framing requests we source our wooden mouldings from ALL of the UK suppliers, so our range is second to none. We enjoy creating and applying hand finishes to make your frame unique. We are always delighted to show customers our workshop and the craftsmanship that takes place there. The selection of the frame and mount for a piece of work is critical. We are renowned for spending the time and giving the advice necessary to ensure your artwork is displayed to its best. 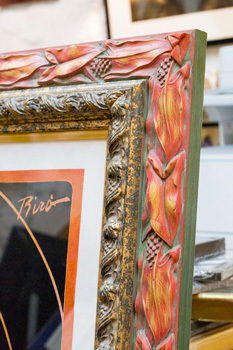 With a team that includes artists, skilled engineers and extensive conservation and framing knowledge we pride ourselves in being able to satisfy all requirements. We aim to complete all standard framing tasks in three weeks or less. If you have a particularly urgent request we may well be able to accommodate it using material from our extensive stock, so please ask. We stretch canvases. We also cater for those looking for low cost frames and keep in stock a range of cost effective ready made frames suitable for certificates, framing school work and last minute gifts. We can order and supply other styles or sizes within days at very competitive prices. 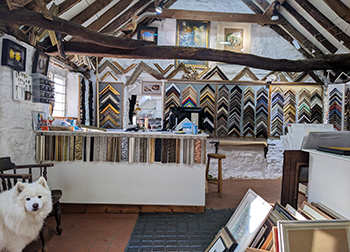 We have many years experience of making and hand finishing frames to customer requirements and regularly frame a variety of objects as well as art. Shirts, medals, stained glass windows, pottery, flags, golf clubs, sandals and a parrot's egg being some of the requests. Cleaning and restoration of oil paintings and water colours can be undertaken and we use a team of experts to do this. We understand the benefit of conservation framing and only provide customers with acid free mount boards, tapes and backings which help conserve the artwork and give protection from pollutants in the atmosphere. When required we frame to museum conservation standards. We use water white glass as standard and also stock a range of specialist glass that can be used to minimise reflection and cut down on the effects of ultra violet light, which causes fading. We keep a stock of salvaged glass for authentic period framing. We can make mirrors to your requirements. 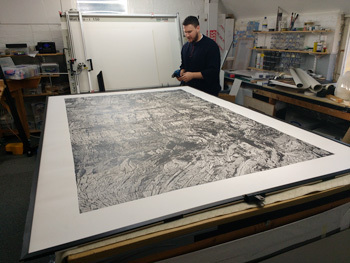 We are able to collect and deliver "oversize" pictures. 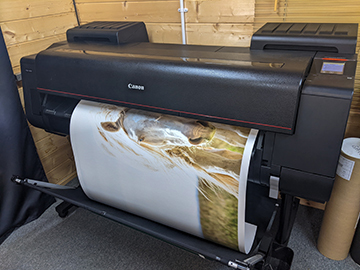 We are able to offer our customers, which includes many artists and photographers, a scanning and giclée printing service using a fantastic range of papers and canvases, this part of the business has grown such that we have now formed a separate art print company "Art Print Hub". We can reproduce and digitally "repair" old photographs and frequently get asked to enhance, enlarge or make additional copies of old family photos. Our gallery features a variety of work including local artists and photographers, many of whom use the beauty of the Ashdown Forest for inspiration. 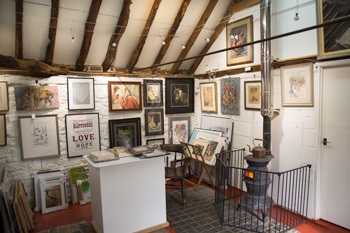 We have a range of fine art and antiquarian prints, historic photographs, original paintings and framed mirrors. We also have greeting cards, photograph frames and framed art suitable as gifts. Please don't hesitate in contacting us for further information.